Do you like Minnie Mouse? Sure, you do! This character is very kind and funny, that's why a lot of kids and adults all over the world love it. Foil and latex balloons in red and bright pink colors will give you a feeling that you are again in a childhood or in the Disneyland. 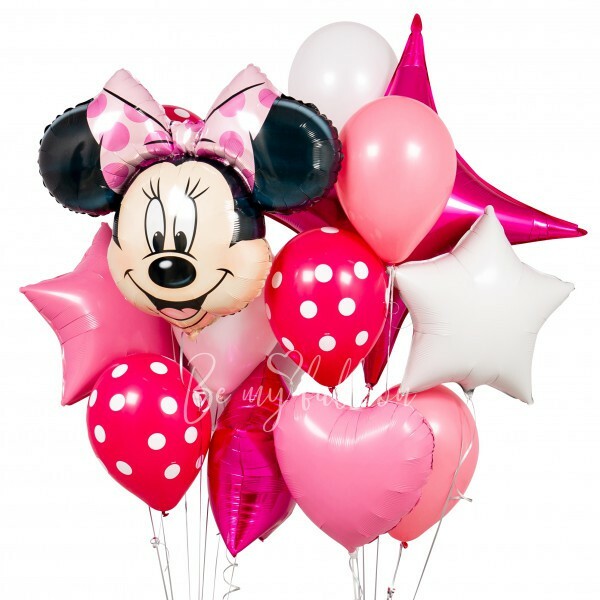 The set includes: 1 super shape balloon "Minnie Mouse" 28", 1 large foil star point 40", 3 foil stars 20", 2 foil hearts 18", 2 polka dots latex balloons 11" 5 latex balloons 11", weight.